We are a creative wedding and event venue styling company based in Kendal, Cumbria, serving the beautiful Lake District, Lancashire and the North West. Purple Swan was formed in 2009 by Carla and Francis, and in 2013 Catherine joined the team. Trained in BA(Hons) ‘Set Design for Film, TV and Theatre’, Carla had worked in the theatre and film industry for over 10 years. Having spent time in London working long hours on film sets, including ‘Harry Potter’ and ‘Nine’, she and Francis moved to the Lake District in search of a more relaxed life. After the birth of our daughter in 2012 Catherine (aka Granny!) moved to Kendal, and in 2016 we welcomed our son to the world. Catherine is an experienced seamstress and a brilliant baker / cake decorator among many other things, and is a huge asset to ‘Purple Swan’. Carla and Catherine use their creative flair to decorate weddings of the many people fortunate enough to get married in this beautiful part of the country, and Francis uses his web expertise behind the scenes. Come and see us in our wedding studio in Kendal – open by appointment only as we are often out and about setting up weddings. We have worked with many top hotels in the area, including Inn on the Lake, Merewood Country House Hotel, The Swan Hotel, The Grange Hotel, Langdale Chase Hotel, Broadoaks Country House, The Lakeside Hotel and many more. We cannot thank Carla and the team at Purple Swan enough. 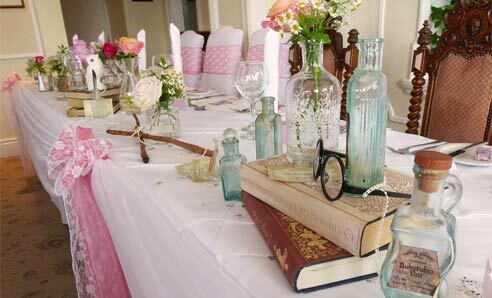 The table centrepieces and room decorations at our wedding were amazing and beyond anything we could have ever imagined. We chose to give our day a Disney Theme and the end result was perfect. All our guests commented on how beautiful the centrepieces were and many have hinted at copying the theme for future parties.